This evening was open for investigation. Karen Stokes manages a host of ideas in the four separate pieces (all premiers of different magnitudes). The evening swelled broadly with concepts of place, our relationship to our environment, and time’s passage. The company was polished and steady. 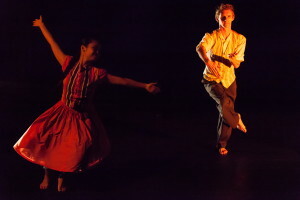 Karen Stokes Dance is a company with beautifully diverse bodies and their cohesion was impeccable. With choreographic ideas that could easily be delivered with excessive nostalgia, the performers resisted sentimentality. A folky modern waltz of a society through time, Red Hourglass, opened the evening. The community teetered on the brink of losing each moment to the past; they were blistered from knowing people and having to say goodbye. Feet pattered on tiny tightropes and couples danced longing for each other in friendship. The curtain opened to reveal a blood red scrim, and the villagers released into a furious dance they all seemed to know. It was celebration, and probably part madness; it was also the first time the isolated pockets of trios and duets joined together to fill the stage. How apt that dance pulls them together. But how does a piece about the passage of time conclude? These characters split into different directions, with more independence and control than at the start, reminding us that in the end, our communities are assemblies of independent journeys. Dualities: Black and White was the richest and most abstract offering on this program, a collaboration with composer Tiziana De Carolis. Mostly contained in a square of thin white tape, Yahudi D. Castaneda and Bryan Peck delivered a strong, linear duet. They began outside of the square and entered gently and clearly as the music began. They never saw each other at the same time, but exchanged body weight, lifted each other and maneuvered tight quarters with a cool, angular strength. Hands or feet were unapologetically placed outside of the box without corollary. This boundary was self-created, and the men were subject to their own consequence, or the absence thereof. They danced with a clean awareness, touching only to lift or support the other. 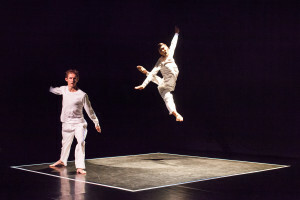 The piece ended in a flash after they faced one another in a jump, a feat that wiped them to the floor. Gallery Construction 5 was a shimmery film with dancer Jessica Cortez in Rice University Gallery’s unwoven light by Soo Sunny Park. This piece is a part of a series called Gallery Constructions— short films that are within and around visual art installations. Initially filmed at a distance, the camera allowed us to be voyeurs of Cortez dancing in Park’s installation of chain link fence. This Rice University installation plays with weight, light, and vacancy— a lush launch for a choreographer. The film felt intimate and secret, as we viewed her, alone, through the pores of the chain link. We were pulled out of the installation as Cortez defected to the stage with matching movement, but here she was exposed and foreign. The evening concluded with Channel/1836,a piece to honor the Centennial of the Houston Ship Channel.Stokes manages choreography, film, specific environment, and history. The sound design with various nature and boat effects and garage band loops was also made by Stokes. The video footage was shot recently, and through editing an antiqued ghost emerged from 1836. The picture was altered to look old, and with the dancers filmed on the ship from land, and the projection across the dance floor from the audience, there was great distance between the characters in the film and the viewers. It all felt very far away; we were detached. But soon the ghost skimmed across the floor like a hologram and Stokes confronted us with the reality of our own Houston history. Militant gliding dervishes spun in red skirts representing the generations of ship channel workers who have remained anonymous to the rest of Houston. A standout trio in red pants were vigorous movers revealing the physical labor in the ship channel. The piece transitioned from era to era and land to sea through video footage, costumes, and hard hat buoys, all the while leaving me stunned about this entire part of Houston I know relatively little about. The dancing took place mostly on the stage, and the filmed dance on a boat and ashore was particularly captivating. The choreography pulled from literal gesture to abstraction and back again. In the conversation afterwards we learned of Stokes’ “movement bank” which shed light on the eclectic vocabulary. Karen Stokes Dance spent the evening putting our life into a keener perspective. We watched broad strokes of time passing whilst teetering on the brim of the present, of knowing people and saying goodbye. We saw an environment strong enough to mold generations remain isolated from the world around it. 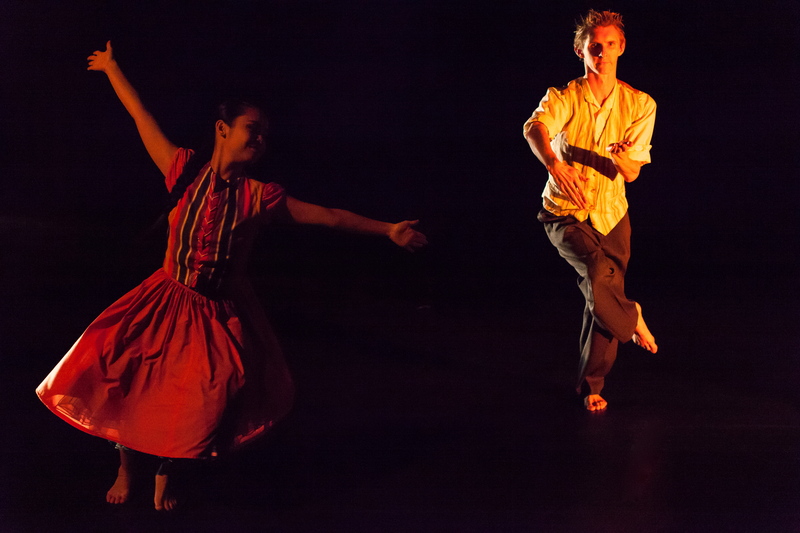 A hefty lot to tackle, Karen Stokes Dance seized an opportunity to use dance to speak a message of individual lives making up our present and our history.